Leading up to my blog tour stop for the Touched series by Nancy Straight on 13 June when I’ll be posting my review of Centaur Redemption (Touched #4), I’ll be posting my reviews of this series. Today I’ll review Blood Debt (Touched #1) by Nancy Straight. As she learns the secrets of her Centaur bloodline, she is drawn into a forbidden love with Drake. Her life may be the blood debt required to pay for her mother’s transgressions. The same person who once held her mother captive, and forced her into decades of hiding, now controls Camille. Her only chance is to seek a piece of her mother’s past that will win her freedom and the life she desperately wants. Wow I had no idea I would enjoy this book this much. When I first came across this book I decided I didn’t wanmt to read it, the blurb didn’t sound that special and I didn’t like the cover. A few months later after reading some awesome reviews about this book I added it to my to-read list still in no hurry to read it. I think eventually I found it free on amazon and donwloaded it, decided to participate in the blog tour and then I finally decided to actually read this book. This book was awesome, with a nice writing style, an original story and an awesome lead character. The story had me hooked immediately, no long introduction but it also didn’t feel rushed. The writing style flows nice and fits the story perfectly. There were quickly some hints that not all was as normal as the lead character suspected, but we didn’t have to wait too long or toos hort for the big revelation. It was just at the perfect moment. The first half of the book I enjoyed more than the second half, there was more happening and I liked getting introduced to the story and the world. Certain events that happened make sure the second half was less action full and even though I still enjoyed it I didn’t love it as much as the first half. That’s why I would like to give the story 4.5 stars, but I decided to round it up to 5. The characters is a point about whcih I am a bit conflicted. I loved the main character, she was awesome, she was strong and stubborn and fighted for what she believed in and was never afraid to voice her opinion. Although she also learned when to shut her mouth, because that would land her in problems. I liked how she dealt with everything that happened. The other characters on the other hand were mostly just as awesome, but in my opinion we learn too less about who they really are. I think one of the reasons for this is that there are a lot of characters and there just isn’t time or palce to get to know them all. I did like most of the character we were introduced to, but I just would’ve liked really getting to know them better. The world building in this book is really well done, not too much or too fast, but at the perfect pace. There are enough answers, but there also remain enough question to look forward to the next book. I love the world building, because it’s so original and I liked the fact that all the myth relevant to this story actually are explained (because I know almost nothing about myths). To conclude: I rally enjoyed this book, the first half of the story was better than the second half, but I still enjoyed the whole book. I loved the main character, she really is an awesome main character. I also liked the world building and the perfect pace in which we got answers. Also at the end there are still so many questions left and I can’t wait to read the next book. This book is free everywhere, so you could grab a copy and see if it’s soemthing you like. I am glad to hear you can discover new books here on my blog. I always find it fun to see new books on other blogs as well, although I also like reading reviews of books I know. Thank you for being a part of Touched Series Tour! 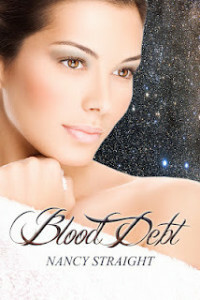 I loved your review of Blood Debt! Thanks :). I am happy I had the chance to read the other books in this series thanks to this tour. The blurb or cover didn’t do much for me, but this is really an amazing series and as the first book is free you can give it a try :).